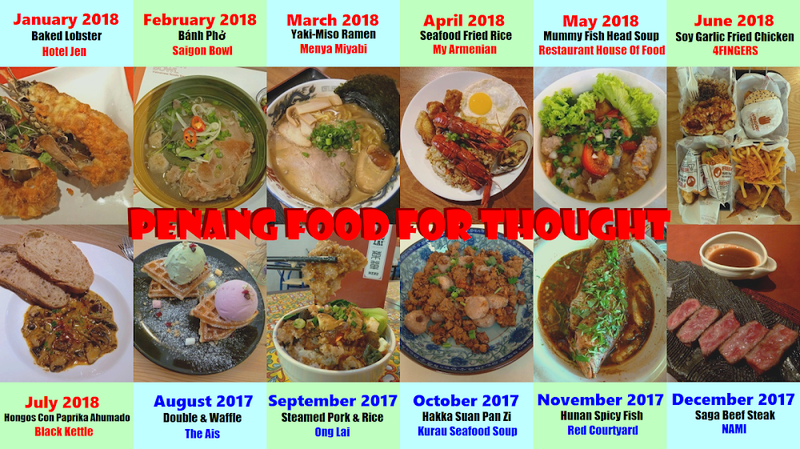 Special thanks to The 9ine By Jackie Wong for extending this food review invitation. The 9ine By Jackie Wong occupies an old shophouse along Jalan Kek Chuan. 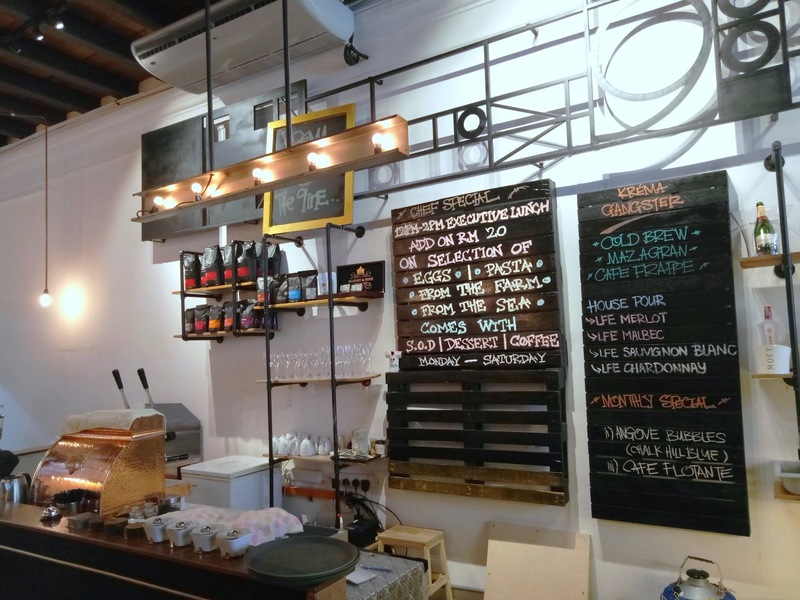 Like neighboring shops, the restaurant has a vintage storefront with wooden doors and windows. Stepping inside, The 9ine is illuminated by dim golden lighting, presenting a mesmerizing atmosphere for casual dining. 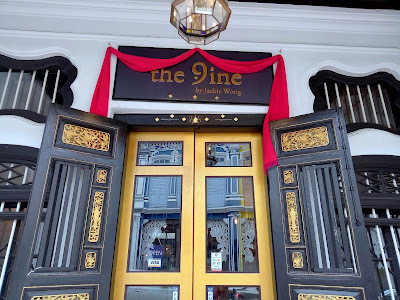 Drawing upon the expertise of Chef Jackie, The 9ine specializes in European cuisine with notable elements from Asia. 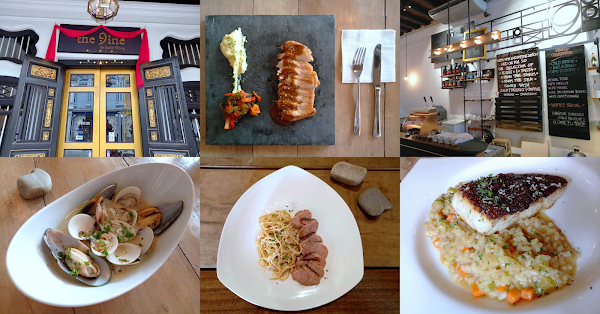 There are à la carte menus for both brunch and dinner. Set lunch is also available on selected days. Today's preview focuses on the brunch menu, which is served between 10:00am and 5:00pm daily. Sitting at the drinks counter is a manual espresso machine plated with brass. Besides coffee and tea, The 9ine also has a modest collection to wines and craft beers. 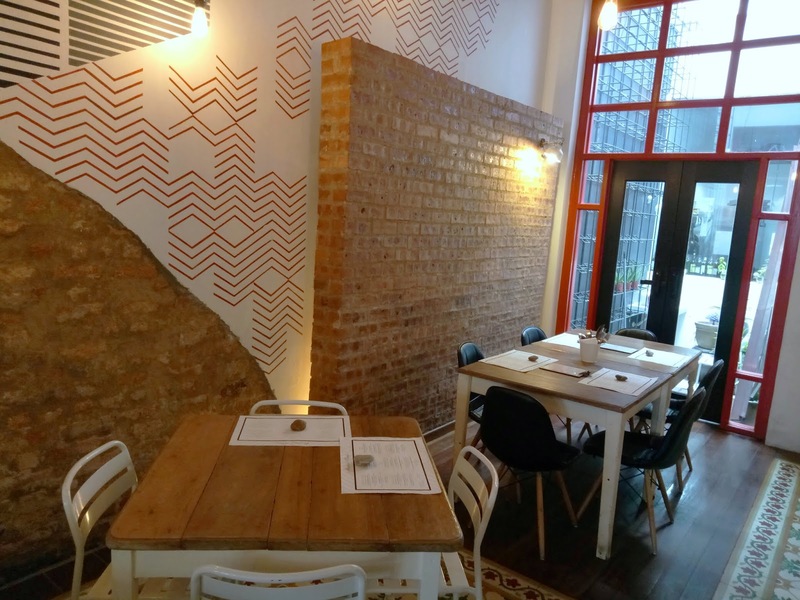 Meanwhile, Kréma Gangster is the restaurant's in-house brand of cold brew coffee. 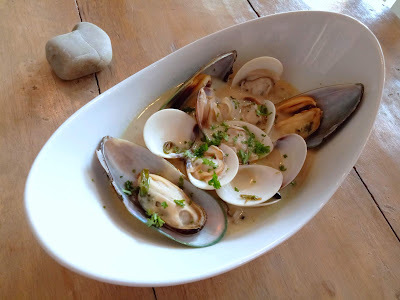 Clams & Mussels (RM23.00) is served for starters, which turns out to be my favorite dish today. Featuring plump clams and New Zealand green-lipped mussels, this delicacy is satisfying to the last morsel. The broth is infused with richness of coconut milk and a hint of spiciness from bird's eye chili. 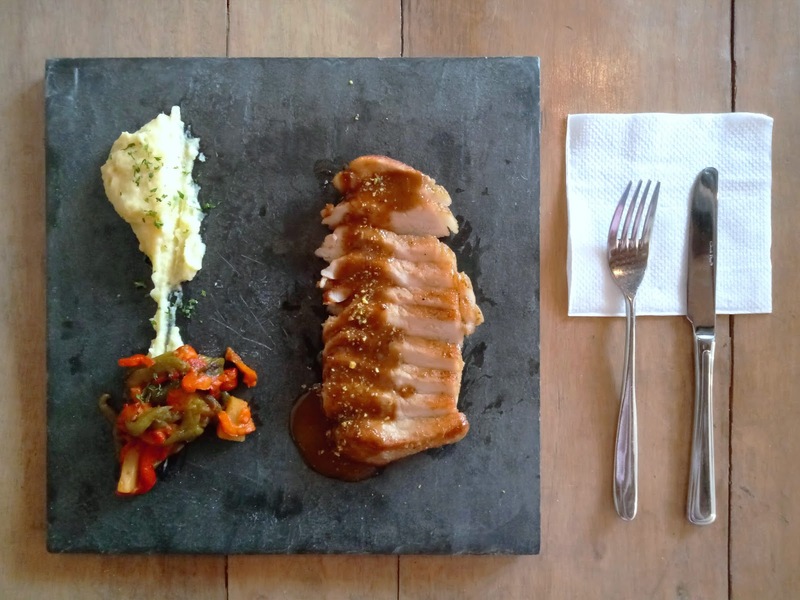 Wild Forest Mushroom (RM18.00) is prepared from scratch in the kitchen. One can feel the soup's pulpy consistency as it passes through the lips. 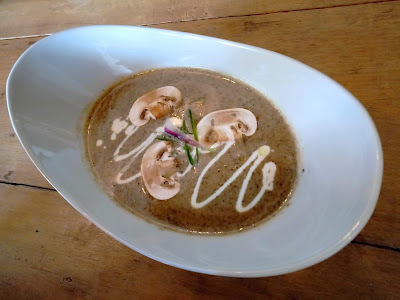 Included in the creamy soup are button mushrooms and scallions. Both elements provide a succulent degree of crunchiness. Glazed Pork Chop (RM28.00) is prepared using sous-vide method followed by a light roasting finish. The slices of succulent pork are flavored by bulgogi sauce and crushed pistachio nuts. Serving as counterbalance are homemade pomme purée (potato purée) and grilled vegetables like capsicum, chili peppers and pineapples. Barramundi & Risotto (RM28.00) is another recommended dish on the brunch menu. The barramundi is pan-seared such that its skin becomes crispy. 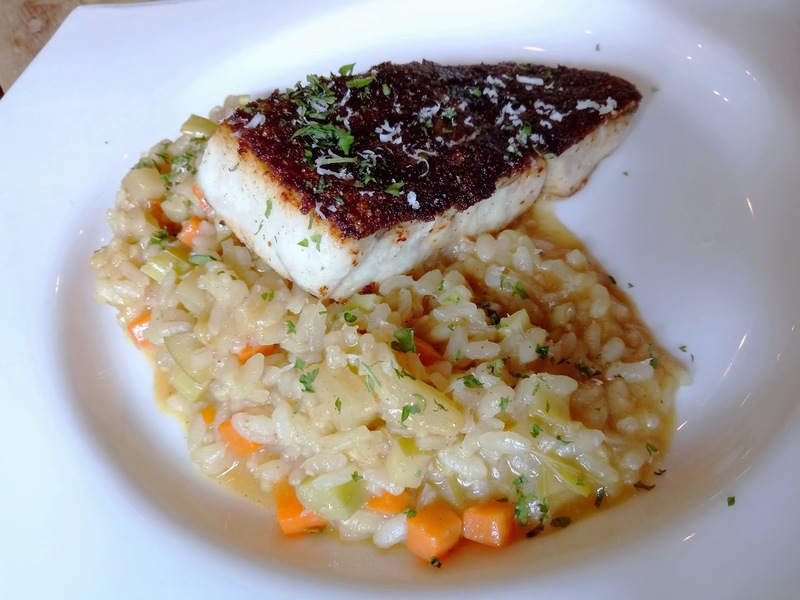 The charred fillet is served over a delectable serving of risotto. Containing apples, pineapples, carrots and asparagus, the risotto is seasoned with a light hint of spiciness. 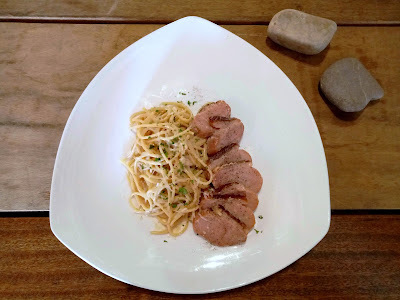 Today's special dish is Classic Duck Carbonara (RM25.00). 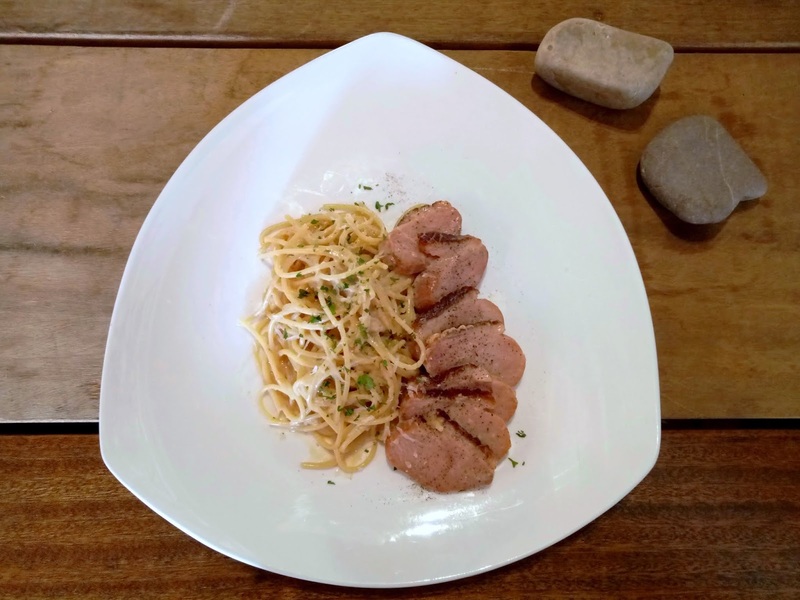 The spaghetti is cooked al dente, which is the Italian's ideal degree of firmness. The pasta contains just the right amount of creamy sauce to do the job. Nevertheless, I feel that the medallions of smoked duck are still the main highlight of this dish. 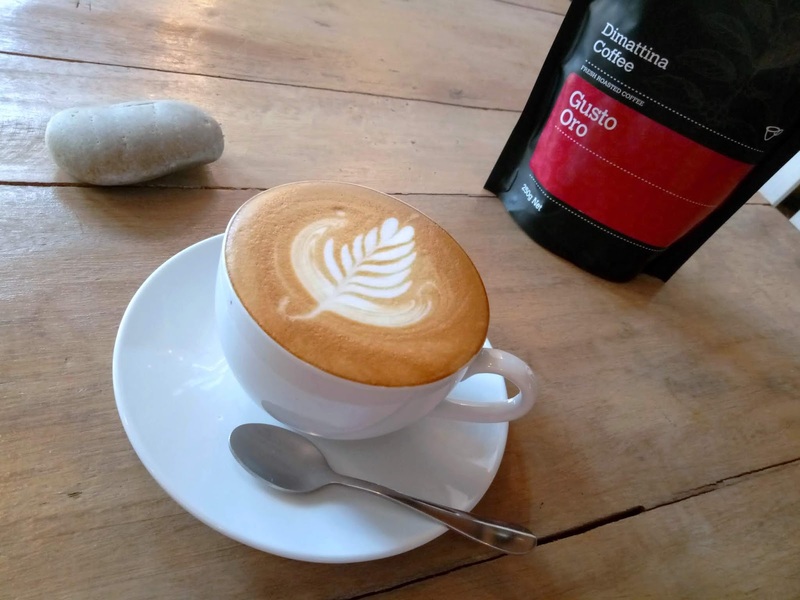 The 9ine's house blend of coffee beans is supplied by Dimattina Coffee. Prepared from espresso and steamed milk, Caffè Cappuccino (RM13.00) presents a creamy sensation on the lips. An excellent cup of coffee indeed. The 9ine offers fine dining dinners from time to time. Chef Jackie usually collaborates with other chefs to craft these limited-time menus. 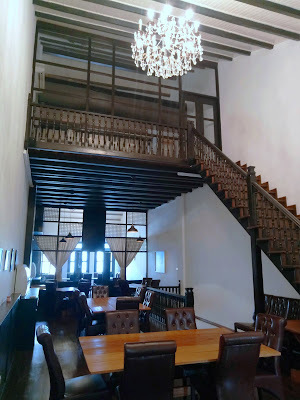 Although there are only a handful of tables at the ground floor, The 9ine has extra dining space upstairs. There is even a private room at the attic. 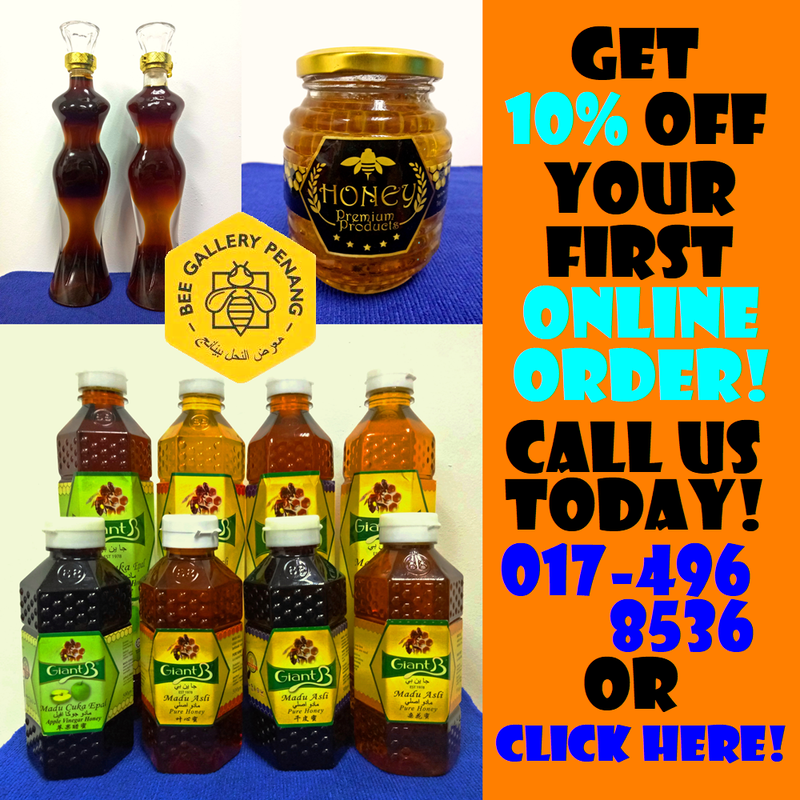 Directions: From Macalister Road (Jalan Macalister), turn to Jalan Kek Chuan opposite of Menara UMNO. The 9ine is one of the shops on the left. Street parking is available along Jalan Kek Chuan, Jalan Irving and Lorong Susu.